Wildfires, like those currently burning in California, have a large environmental impact. Uncontrolled blazes can burn tens of thousands of acres, destroy vegetation and settlements, and severely affect local and regional air quality. An international team of scientists, led by Yafang Cheng and Hang Su from the Max Planck Institute for Chemistry in Mainz, have now found that wildfire impact on the atmosphere may be even stronger than previously thought. The researchers discovered that large amounts of soot, which contains a lot of black carbon and is released by wildfires, can be transported through the troposphere up to the lowermost stratosphere around 10 kilometers altitude. Black carbon is the most strongly light-absorbing aerosol material from fires and is regarded as one of the most important individual climate-warming agents. To gather the data, the scientists integrated a specially-designed Single Particle Soot Photometer (SP2) into an airfreight container on-board an Airbus A340-600 from Germany's Lufthansa airline. The SP2 can detect individual soot particles and determine the concentration and coating of black carbon aerosols. The study analyzed measurements that took place during 22 flights between Europe and North America from August 2014 to October 2015, including sampling over a total of 230 flight hours, mostly at altitudes in the range of 10 to 12 km. The research was part of the CARIBIC project that pursues an innovative approach to study atmospheric composition, chemical and physical processes, and climate change with the help of passenger aircraft. "In the stratosphere, a black carbon particle can have a much stronger effect on climate than at lower altitudes because of more intense solar radiation, further enhancement from the back-scattering of clouds, and long particle residence times," says Yafang Cheng, principal investigator of the CARIBIC-SP2 black carbon project and leader of an independent Minerva research group at the Max Planck Institute for Chemistry. "Via deep convection and specific weather conditions, wildfire emissions can be transported into the lowermost stratosphere, where we have gathered high-quality measurement data during a large number of intercontinental flights," adds Jeannine Ditas, a postdoctoral researcher in Cheng's group, who worked on the SP2 measurements. Extended warm seasons, drier soils and vegetation, and changing precipitation patterns are leading to more frequent wildland fires with increased duration and intensity in many parts of the world. "Long-term and wide-range measurements are essential to quantify how wildfires affect the atmosphere and improve our understanding of current and future climate change," states Cheng. 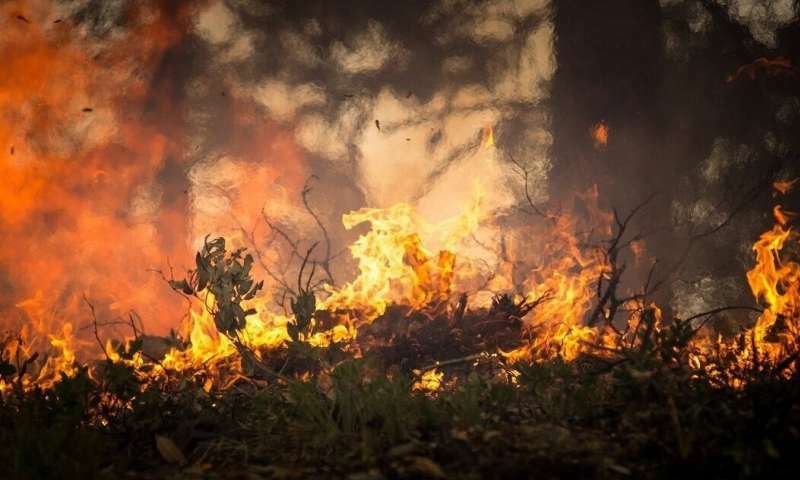 "As a next step, we plan to extend the observations to Africa and Asia, where wildfires are very common," adds Hang Su, a co-investigator, research group leader at the Max Planck Institute for Chemistry and Professor at Jinan University in Guangzhou, China. Further analyses of the measurement data will address the fate of aerosols in the stratosphere and their interactions with clouds.